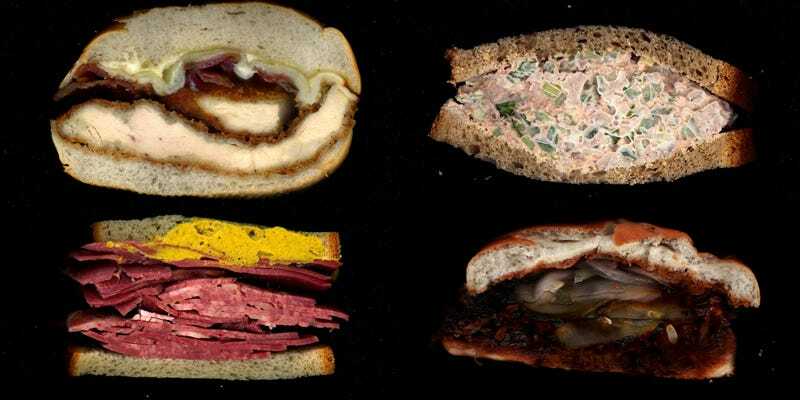 If you read websites about food, NYC or general wackiness, there's a good chance you've recently run into Scanwiches—a Tumblr with nothing but flatbed scans of bisected deliciousness. Here's the story behind the site. I love Scanwiches. It's a fantastic concept, aesthetically beautiful, and its creator and I both share similar tastes, like the ridiculously good Vietnamese meatball sandwich at Banh Mi So No. 1 that's just a few blocks away from Gizmodo HQ. It's not every day you see your favorite sandwich baring all on the web as you eat it. The site is the brainchild of Jon Chonko, an NYC designer at thehappycorp global. Once I got in touch with him via Tumblr, I had to know more about the how, what and why of this excellent work. Q: When did the idea for Scanwiches strike, and what was your inspiration? A: I think the word popped into my head first and then I had to see how it would actually look. I've always loved scanning things. It's a very specific way of capturing an image. Everything—exposure, depth of field—is totally pre-set on a scanner so you try and explore the stuff you do have control with. Once the project started getting popular people began sending me things, especially foods, that people have scanned. There's a guy who does fast food, another person who did a project scanning green market produce, and several artists who do scanned flowers. It's a weird little genre I didn't now existed and was pleased to find I was a part of. Q: What kind of scanner do you use? A: I use my girlfriend's old scanner. It has a broken lid and she didn't want it. It's an HP scanjet 4570c and it was made in 2002. The thing is on its last legs. It sounds like a subway train hitting the brakes every time it starts a scan. I think it has a max optical resolution of 400 dpi but it's been a while since I read the manual. Q: What is your process for scanning them? Do you just clean the glass really well after each one or put down some kind of transparent film for easy cleanup? Do much cleaning up in Photoshop or anything? A: I clean the glass at the end of each set with Windex and a paper towel but between sandwiches it just gets wiped down. We started with a plastic film when we first scanned but we found that it fogged up when we did hot sandwiches. Straight onto the glass gets the best quality. This is a full time sandwich scanning machine—we have another really nice photo scanner for office use. I take the image into Photoshop and do some white balance and color-correction but nothing dramatic. The sandwiches have to look appealing and realistic. I want people who see a sandwich on the site to recognize it if they've ordered it. It's about education first and delight second. Q: What's the sloppiest sandwich you've scanned? A: Eggplant Parmesan from Parisi Bakery. I had to wipe the thing down with a wet cloth afterwards. If you have yet to do so, go check out Scanwiches this instant. Then, do the right thing: get yourself a sandwich. It's lunchtime!